Cleo House Jr., center, director of the SFA School of Theatre, works with Manvel senior Edwin "EJ" Villanueva, left, and Webster senior Tyler Canada, right, as they rehearse a scene from the School of Theatre's upcoming play, "Sweat" by Lynn Nottage, while Copperas Cove senior Sarah Wiseman looks on. NACOGDOCHES, Texas - Working late night and weekend hours is predictable for theatre students for several weeks weeks leading up to presenting a play. 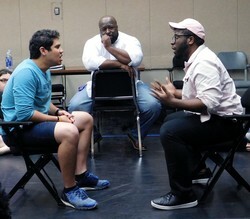 But the tiring work is also rewarding for students in the Stephen F. Austin State University School of Theatre, especially when presenting a play like Pulitzer Prize-winning playwright Lynn Nottage's "Sweat." "A production like 'Sweat' rehearses for five days a week for three and a half hours a night, plus one weekend day for five hours, for about three and a half to four weeks before going to into tech and opening," explained Cleo House Jr., director of the School of theatre and the play's director. "This is the time commitment made by student actors, directors and stage managers." Nottage's "Sweat" won the 2017 Pulitzer Prize for Drama. The play opens at 7:30 p.m. Tuesday, Oct. 2, for a five-night run at SFA in what will be the play's Texas premiere. It's the story of working-class Pennsylvanians whose livelihoods are threatened by the sudden disappearance of long-held manufacturing jobs. Their story plays out in a local bar. From building scenery to designing the lighting, costumes and props for the play, students have a hands-on approach to every job behind the scenes, House said. "We have student light, projection, costume and props designers on this show," House said. "The time commitment varies for each, but the amount of collaboration and detail that goes into making believable and artistically viable choices is quite painstaking. Our students work closely with faculty advisers to make sure they stay on track." For Ernesto Dominguez, senior theatre student from Del Rio, research began last summer for designing costumes for "Sweat." Dominguez researched images of industrial steel workers wearing dark colors and learned about the area and time in which the play takes place in order to reflect the characters through their costumes. While the goal is to be finished with costumes by the first dress rehearsal, there are adjustments that are made up to opening night. "We look at how the actors are moving - are they bending down, are they on the ground wrestling - to try and give them something that doesn't restrict movement, especially to prevent tears or any wardrobe malfunctions," he said. Dominguez believes that authentically designed costumes help to define characters. "They give an audience a better understanding of who the characters are," he said. "Sometimes audiences aren't even aware that a costume may give them an impression about a character." When describing what happens behind the scenes of a theatre production, Richmond senior Daniel Hicks says, "it takes a village to put on a production." As Stan, the bartender in "Sweat," Hicks said knowledge of "bar culture" was important for his character development. Just the logistics alone can be overwhelming. But properly executing those can make the difference between an authentic "bar scene" that is believable and one that misses the mark. "You have to keep track of where glasses are and who is drinking what," he said. "You have to make sure you have the props you need to do bar business, like restocking nuts." Those are the little details. More important to him is the character work that goes behind becoming "a 51-year-old limping bartender in Reading, Pennsylvania." "The research alone takes a long time, and if you stop at any point, just because you think you are there, you've lost the battle," he said. "It's an art of dedication." Being a bartender himself, Hick found using bar etiquette an easy adaptation. But he also worked on his accent and the limp his character has. "Learning where the limp stems from and how my body should compensate for it has been a challenge," he said. Co-lighting designer Mia Lindemann, a senior theatre student from Prosper, said lighting provides a subtle way of helping to tell the play's story. "A saying I've heard is that people don't notice lighting or sound or anything tech-wise in a play unless it's bad," she said. "If the lighting is good, you're not going to question it; it happens seamlessly with the story and it helps reveal things about the characters. It's more of a feeling that is created with lighting and less of a noticeable thing." Lindemann researched bar images looking for a "homey, amber-lit bar with a feeling of camaraderie," for the early bar scenes. "We were going for a more blue-collar, working-class bar," she said. The play takes place in separate timeframes - in 2000 and in 2008. As such, the bar has a more homey feel in 2000, whereas in 2008, the bar scene gets a "cooler, more updated look," Lindemann said. "It becomes more modern and gets a little colder feeling, because it has changed; it's new, and it's a little more high-class than what it used to be." The positioning and movement of the characters on stage to tell the play's story and achieve the desired dramatic effect can be a meticulous process, especially when scenes that involve fighting or fast-paced movement come into play. "In rehearsal, I initially try to listen to what the script is telling me as it relates to blocking and staging," House said. "There's a certain rhythm to the script, and I'm trying to set the actors up in such a way that their impulses and my concept can merge. "Our play also has an intense fight scene," he added. "This requires significant work with our fight choreographer, Dr. Slade Billew. This is an interesting collaboration between myself, the actors and Billew, because while he's creating this event, it must still exist within the rules and storyline that we've established up to that point, in addition to being safe and repeatable for the actors." Change and adaptation on stage and behind the scenes are constants in live theatre, according to House. "Each actor brings a different level of experience, so as a director, you must navigate that," House said. "Not everyone has the same needs or works in the same way. It's a constant dance - give and take - that ultimately becomes a collaboration toward a singular directorial vision." "Sweat" will be presented at 7:30 p.m. Tuesday through Saturday, Oct. 2 through 6, in W.M. Turner Auditorium in the Griffith Fine Arts Building, 2222 Alumni Drive, on the SFA campus. Because of its themes, "Sweat" is recommended for age 13 and up.